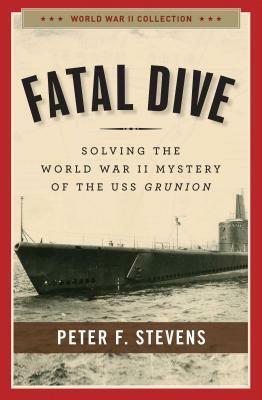 Fatal Dive: Solving the World War II Mystery of the USS Grunion by Peter F. Stevens reveals the incredible true story of the search for and discovery of the USS Grunion. Discovered in 2006 after a decades-long, high-risk search by the Abele brothers—whose father commanded the submarine and met his untimely death aboard it—one question remained: what sank the USS Grunion? Was it a round from a Japanese ship, a catastrophic mechanical failure, or something else—one of the sub’s own torpedoes? For almost half the war, submarine skippers’ complaints about the MK 14 torpedo’s dangerous flaws were ignored by naval brass, who sent the subs out with the defective weapon. Fatal Dive is the first book that documents the entire saga of the ship and its crew and provides compelling evidence that the Grunion was a victim of “The Great Torpedo Scandal of 1941-43.” Fatal Dive finally lays to rest one of World War II’s greatest mysteries. Peter F. Stevens, news and features editor of The Boston Irish Reporter, is a veteran journalist with a specialty in historical writing. His work is syndicated by The New York Times and has been published in dozens of magazines and newspapers. Stevens is also a two-time winner of the International Regional Magazine Association's Gold Medal for Feature Writing and the award-winning author of The Voyage of the Catalpa: A Perilous Journey and Six Irish Rebels' Escape to Freedom. He lives in Boston, MA.